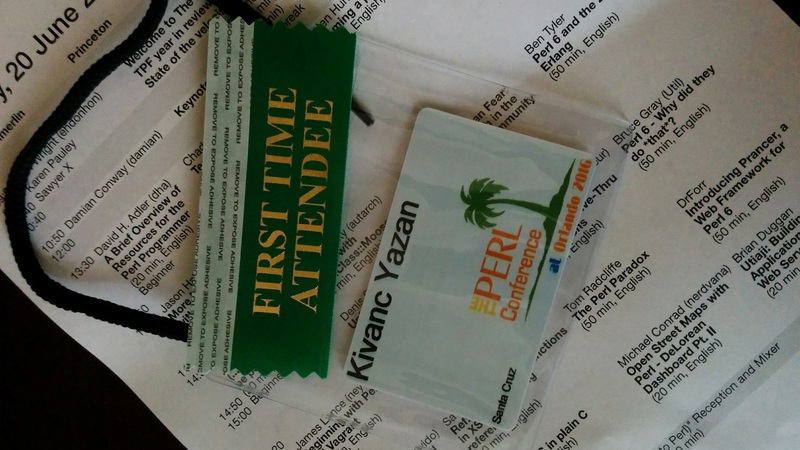 Last week, I attended my very first YAPC (Yet Another Perl Conference) at Orlando. While I feel I can write for pages, I want to talk only about several things, following the newest format “online newspapers” are using. I remember stories on Quora about tourists who tried to make a day trip to California all the way from New York, and I actually laughed at them too. So I knew the continent is big, I guess I never realized it is “that” big. I was at San Jose, California. I took a flight to Orlando with a stop at Dallas. These were almost 3 hours each. To top it all, Orlando is 3 hours ahead of California, so I also experienced a slight jetlag (not being able to fall asleep even if it’s pretty late etc). But we made it safe and sound, so it was fine. 2) YAPC is not pronounced as Y-A-P-C.
My life has been a lie. Well, it’s not that bad, but I was very surprised to learn that “YAPC” is pronounced as yapth-zee instead of reading every single letter out loud. 3) Perl 6 is pretty good. To be completely honest, I had my prejudice towards Perl 6. But it actually looks super nice! I listened Conway’s keynote on Perl 6 very carefully (which you can too), and attended several beginner talks on Perl 6 (beginner track was a great idea). There are many things that changed, but for one, now you can access anything about arrays with @, as opposed to @ for array itself and $ for one particular thing in an array. Many new features can be replicated with several CPAN modules, if you want to have a taste of Perl 6 while still using Perl 5. 4) People actually use IRC. After reading notes for first-timers at YAPC web site, I knew I had to install some sort of IRC client to my computer/smartphone. I truly had no idea how to even start. I basically searched for IRC in application store, installed the very first thing that came up, and I was online! I am glad I was: The chat is amazing. It almost felt like it’s subtitles to talks I’m listening to. It was very helpful too: I had problems connecting to projector at testing room, and I couldn’t resolve. So I sent a message to #yapc, and thanks to helpful people I was ready to go in just a few minutes. Now I really have to dive into IRC, install it so that I’m online all the time as opposed to being online if your phone is connected. There was actually a talk on IRC, but I missed it. I’ll see it as soon as possible though, thanks to video streaming! 5) Lightning talks are fun and encouraging. Another note for first-timers recommend not to miss a single lightning talk, because they were too much fun. I took the advice one step further: I actually had chance to make a lightning talk! I was very excited when I was told my talk idea sounds pretty good. So I spent Monday night preparing slides, rehearsing, and submitting. Next morning I learned I am on the list for the day! My presentation, if you ask me, went very well. I talked about the only CPAN module I’ve ever built, which is topic for another blog post. I’ve received very encouraging feedback afterwards. I really liked other presentations too! They were fun, and I learned quite a few things. I suppose the next stop is Hokkaido!